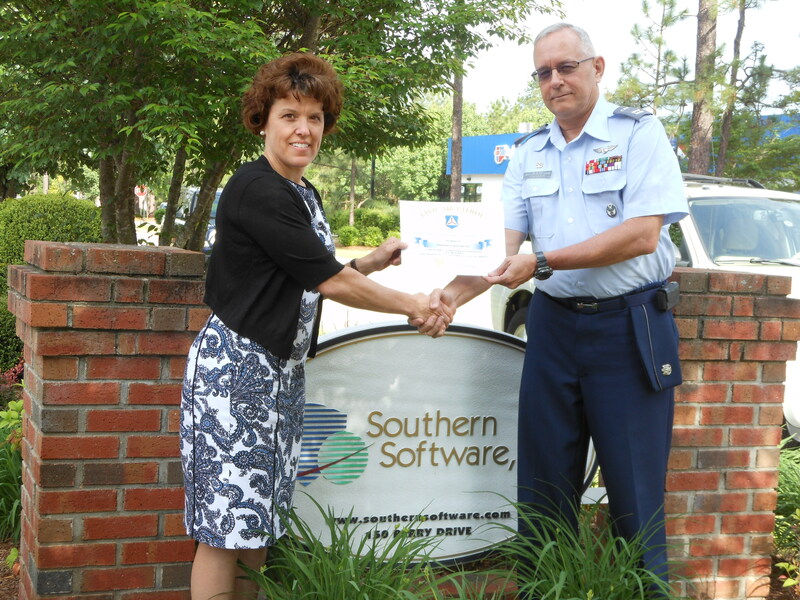 5/21/2014–Brunswick County, NC–Gary Fischbach, Commander of the Brunswick County Composite Squadron, NC-170, recently presented a certificate of appreciation to Jennifer Meggs, CEO of Southern Software, Inc. The Southern Pines, NC-based, employee-owned company, made a significant contribution to the squadron's cadet activity fund. The money will be used to support NC-170 cadet activities during the remainder of 2014. After the certificate presentation, Captain Fischbach and Captain Bill Sullivan, NC-170 Public Affairs Officer, were invited to share the CAP history and NC-170 missions and activities with all Southern Software employees during the company's monthly staff meeting in Southern Pines on 2 May. Captain Fischbach, a resident of Shallotte, NC, is the Lead Programmer for the Jail Management System for Southern Software, which specializes in Public Safety Software and Financial Management Software for local governments. Other on-going fund raising activities for NC-170 include annual Wreaths Across America sponsorships, sales of Dining and Attractions Guides and sales of Belk Charity Sales Event tickets twice a year.